I arrived in late November to a rather frigid New Zealand. The icy winds howled around me as I crossed a snowy mountain pass to meet Chris Streat, to go off to battle headwinds with 5-20kt ground speeds – in a sailplane! But this is the time in New Zealand where the unstable volatile weather sometimes offers brilliant flying – you only need half a day of decent weather to go a long way, and those times you need to be ready to go. As I look back on the month of December, it really was a great month of flying through places I’ve been dreaming about for years. I first got the paraglider out of the bag on 2 December, nearly two weeks after arriving in the country! I’d decided to start on Mt Alfred, situated centrally to the mountains I know very well. I haven’t flown this particular site very often, perhaps since it is as close to an official site as you get in the Glenorchy area I may have been avoiding it! But on this day it served me well enough. I walked up and started flying alone, but was surprised to see another paraglider arrive after me as I slowly soared up the slope in stable conditions. I face landed half way up Alfred and then top landed on the summit as the conditions were very slow. There a woman greeted me enthusiastically before realising that I wasn’t her friend (that I’d seen flying) after all! He never did make it. As until late January, I was flying without my minimalist bluefly vario since the on switch had broken while carrying it around Turkey. Searching for climbs in front of the summit of Alfred with a NW breeze I circled and circled, following something off the summit at about 3pm, before realising that maybe I wasn’t actually going up anymore! I crossed to Temple Peak and got stuck a while trying to get in front of Stair Peak before committing myself to diving into the Shotover. Here I began a fantastic flight, crossing the Matukituki to fly further north (Triple Peak, Minarets) for the first time. The views were incredible but annoyingly I was distracted by thinking about my late start and wondering how the others were faring from Coronet and Treble cone. I had the FOMO syndrome that Bryan later mentioned – fear of missing out! Nevertheless I had a great flight and all was going well until I got a glimpse of Lake Wanaka from high above and noticed the strong wind on the northern end of the lake. There was some interesting convergence lift on the way down but when I sunk into the wind there was no way I could go forward anymore, even on speed bar. So close to Makarora I had to turn tail and land on the wrong side of the lake! I walked to Minaret station and made contact with the farm hands and spent the night there before getting a lift back with them the next morning on the boat. The kids take this to school every day and luckily I’d timed my flight to coincide with the weekly shopping trip so I got a lift to Wanaka too. In Wanaka I visited Joel and grabbed a bike, visited Kat, and hitched back home, visiting Louis on the way, just in time to get the car to pick up Kamila from Christchurch airport. For the second season Chris Streat offered to fly me in a Duo Discus with the Omarama Gliding Club. He has a hang gliding background and flying with him gives me insights that stay with me even now. There’s always a lot going on at the time so it can take a while to sink in but mainly I’m flying to get an appreciation for how it all works and how to fly better myself. When we flew on 29 November it was a very tough start and tricky to get into wave. I was even feeling a bit out with all the tight turns we were doing in rough air. But we eventually got above the turbulent boundary layer (blowing 30kt) and into the wave (60kt). Once you do that the distances you can cover are quite incredible – we had a look at the Shotover before flying up to the head of Lake Tekapo and riding an enormous lenticular formation, inspecting a southerly front behind Omarama before getting drilled in a sinky headwind for a …. 8:1 glide! 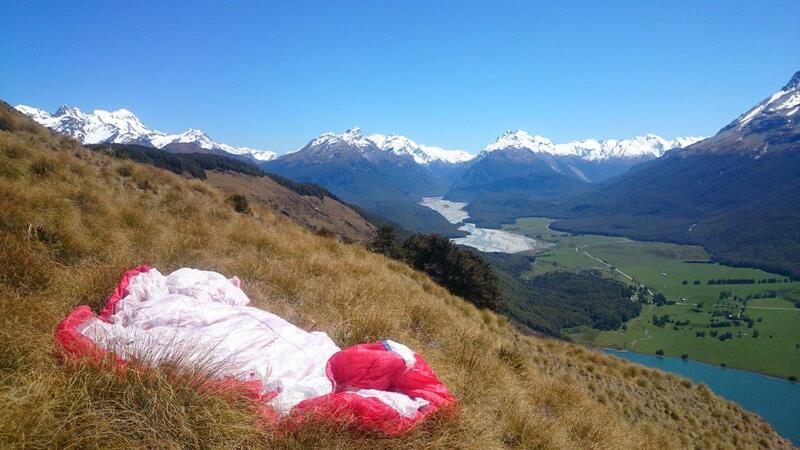 On 7 December it was a blue front day with excellent flying conditions – Bryan Moore and Pete Groves broke the paragliding open distance record. I originally wanted Kamila to go first but Chris suggested it was a day for me to fly. However after we’d flown all around the place including Mt Cook and beyond we decided we could get two in one. I reckon Chris got the last thermal as he took Kamila the same day and did a similar flight with her, landing in the evening with strong seabreeze gusts threatening to pick up the glider. I’ve certainly been spoilt by flying some bigger distances through wild country. But often it’s actually the smaller flights that give me the most excitement. One of these was a late evening soar on the slopes of Temple Peak when it was totally overcast. My first job was to overfly the slopes below so I could spot the elusive Harry’s hut. Then it was back to the slopes and working light lift until I almost climbed to the summit of Temple Peak. Flying back to the meeting point on a bumpy tussocky knob I got Kamila’s attention before nearly landing in her arms. Little flights like this on the less classic days are great practice for xalps. I had intended to go with Kamila to the West Coast and bring the pack rafts but when I checked the forecast again I had to cancel paddling and get my wing! The first day wasn’t super special and I wondered if I had made a wise investment with my limited brownie points. When most of the showers had finished I climbed up a misty Scott creek and found a launch in Kay creek. Gliding out under 8 octas of low cloud it was really cool to climb on some steep bluffs, giving me just enough height to safely negotiate the wind coming through the Caples and land there. The following day I walked up toward Steele creek and launched as clouds lifted about the pass. Prematurely I took a glide over the pass south, so I had to walk again up to another pass. Wet and cold I huddled beside a rock as I waited for a shower to pass, but half an hour later the sun came out and I took off, thermalled up, and flew out to The Divide at the head of the Caples. Here I top landed again with showers blocking the way to the south before reflying towards Te Anau. Emerging out of the bushes onto the highway I hitched as far as I needed to get an updated weather forecast. It was still saying good things about the days ahead so I hitched back to Gertrude saddle and climbed up quickly, reaching the pass in one and a half hours as the morning clouds started burning off and lifting above the pass. A very dramatic place to start a flight, and with clouds billowing around I followed the Hollyford road out and found various convergence spots on my way across towards the Routeburn. The open distance record crossed my mind but it took me until 3pm to fly the first 30 km, on the western slopes of Mt Earnslaw. I continued up the Dart and flew over the Minarets again, the massive Mt Cook my beacon in the distance. The clouds looked epic but unfortunately after crossing Lake Wanaka at The Neck I was unable to connect and I landed there at 6pm with just over 100 km flown. With no phone reception I raced up to Sawyer burn hut in readiness for the next day. I was up early but there was a southerly blowing, with small white caps on Lake Hawea. I flew and was plucked immediately off the spur – the instability was great but the wind was a little unsettling. I flew north towards Mt Brewster with an odd headwind component closer to cloud base. Landing in Cameron creek the air was like a washing machine – after another short local flight there with the same air I thought I’d wait a bit before trying the other (western) side. Here I found while flying that I was not only in the lee of the southerly Makarora valley breeze but also in the lee of the easterly breeze above. I followed a sailplanes lead and got above the peaks, before deciding to call it a day and landing (backwards I think) in Makarora. To my surprise the small weekend competition had still run at Treble Cone although they’d also cancelled the task due to wind. I hitched back to Wanaka and joined them for the following day (Sunday). While the wind had dropped it was more stable on Sunday. 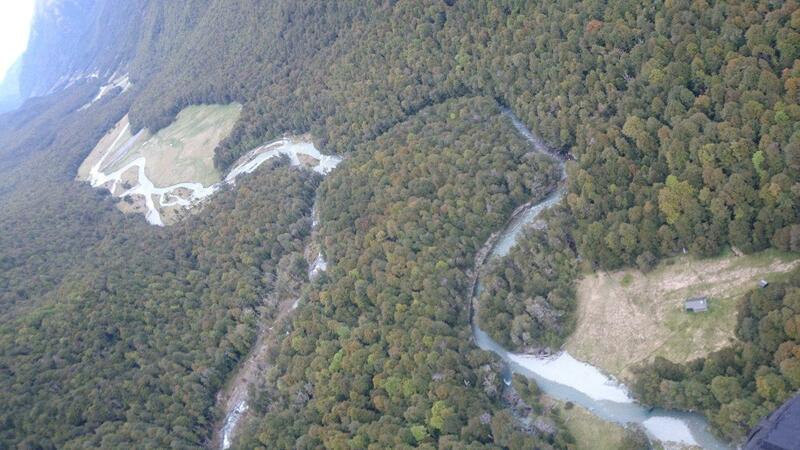 I took off at around midday and was sick of Treble Cone before I’d even started. Racing towards the bigger mountains I got lower and lower until crossing to the sharp Homestead Peak spur on the Rob Roy side of the Matukituki road end. I was singing its praises as I soared the light valley wind and connected with thermals higher up, sailing past the enormous glaciers on the eastern flanks of Mt Aspiring. There was some funky air in the East Matukituki before crossing into the Wilkin valley for my first time on a paraglider. Here I decided normal rules wouldn’t apply and I dove across the valley for another sharp spur. It saved me again and I got up onto Mt Aeolus before gliding down the Wilkin. A collapse here resulted in a cravat that took some time to clear with me flying around in circles. 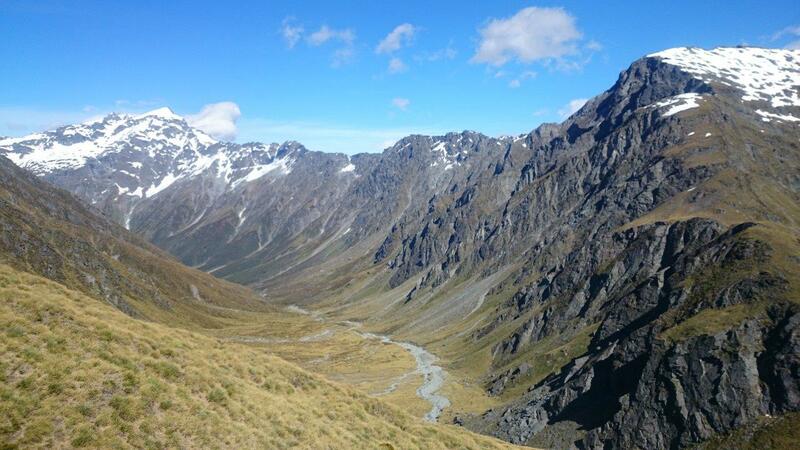 Crossing Makarora to the McKerrow range and easy lift took me up steadily on western faces. Further north though I encountered headwind and was unable to get enough height to cross onto the Mt Brewster massif. I landed in the lee and the most rewarding part of the day was racing up and around spurs with my glider in a rosette to make short flights across gulches and ultimately reaching Mt Brewster hut just in time for sunset. After a lazy morning I took off and flew up the spur behind Brewster hut. For some reason or lack thereof I decided to start flying around Mt Brewster. Popping through a pass into Long Flat Creek I found myself in lee and treaded water a while before popping across the Hunter valley for to scratch my way up from there. I wasn’t encouraged by the wind and I’d decided to head back down south until I got onto the peaks and looked north. With Mt Barth and Mt Huxley beckoning I decided there and then that I’d go that way! Reaching Mt Huxley I was pushing a north headwind in the lee of spurs in very dramatic rocky country. There wasn’t much margin to play with so when I got above Mt Huxley for a brief moment I decided to glide over the top to the east. It was an amazing mountain of solid cliff faces commanding respect. Further east I got stuck in the Temple Burn beneath Mt Maitland for a while. It was engaging making a quick turn in fleeting thermals as I battled wobbly leeside and tried to push my way out. Around the corner I got back in silky smooth air and landed for a refreshment stop before thermalling up and out. After a second go at getting high I drifted tailwind in the northerly and crossed a shady section underneath an epic convergence that was building. Finding company from a soaring bird as I joined the likely place – a sunny rocky spur protected from the wind – I connected and thermalled up to the highest height I’ve ever been in New Zealand. A 3500 m base cloud street was giving me a free ride back to Wanaka! Back in phone reception I made arrangements to land at Middy and Lucy’s for a bbq with Louis and we picked up Kamila to spend that night with Bryan and Kat. The following day was the final icing on the cake for the week as I flew the record triangle. What a week of flying dream routes in the mountains! The three days leading up to Christmas promised another good weather window. On 22 December I had a false start at Tooth Peak, after dropping Kamila and Mum there to do the Caples Greenstone loop. The old boots I’d borrowed from Mum’s collection had fallen apart, it wasn’t the best route to find a launch, and the wind was howling. I dropped my pack at Kinloch with the car and then ran it in jandals, hitching back home just before hearing from Chris that he was going kiting there! I invited him over that evening but being quite the terrible host I changed my plans at the last moment, racing up Harry’s track to launch behind the house at 5:30pm. I was also due to meet up with Bryan at Sugarloaf pass the next morning and I cheekily thought that I’d fly there. I almost managed it, getting away from the NW on the sheltered part of the Richardson range and flying over Mt Cunningham into the Dart. Having thought that the rest was easy I decked it beneath western faces as the sun set at Daley’s flat. I used the Daley’s flat footbridge and had a nice walk up towards Hedin Peak, where I’d been years ago. Getting airborne at midday, I charged off to hit eastern faces as I flew straight towards Tutoko. Bryan had made radio contact but he was later to launch, so I thought I’d get a sneaky dog leg out to this giant of the Darran’s before we set off for the Olivines. After a long crossing of the Hollyford I was struggling a bit, and I suggested Bryan may wish to avoid the seabreeze. He wisely did and flew north while I lingered in the Hollyford and followed the sea breeze south, choosing my crossing carefully to soar up beside Lake Mackenzie. After my delay I dropped through Emily pass again into the Routeburn, flew around Momus when I couldn’t get over the top, got up from low on Chinaman’s bluff and followed the Dart valley around to Mt Cunningham, passing Dave Watson on the way. Bryan was meanwhile past Makarora and I wondered what I should do. Seeing Tooth Peak in the distance I thought I’d fly down there and meet the girls, but half way through the glide I changed my mind. What a pity, I ended up decking it at the very next hut – Dart hut. On Christmas Eve the wind was evident quite early so I changed my plans to go out over Rees saddle. The wind was strong enough to blow me off balance in the narrow valley but still I decided to launch on the slopes of Cleft peak. I knew the conditions would be terrible and there was no surprises. In rotor I struggled to keep the wing above my head as I was sinking like a stone. I gave the terrain a wide berth so I perhaps could have flown further, but as it was my short flight saved several hours walking. It’s good to practice these kind of things but it’s more complicated to choose the right time and place. For sure my flying has improved with the benefits of experience and a great performing wing. I love learning the lay of the land and getting familiar with the mountains I know but there’s always more to see and to experience so it’s a great mix. There’s more to see around the world too but the Southern Alps are never too far from my mind. 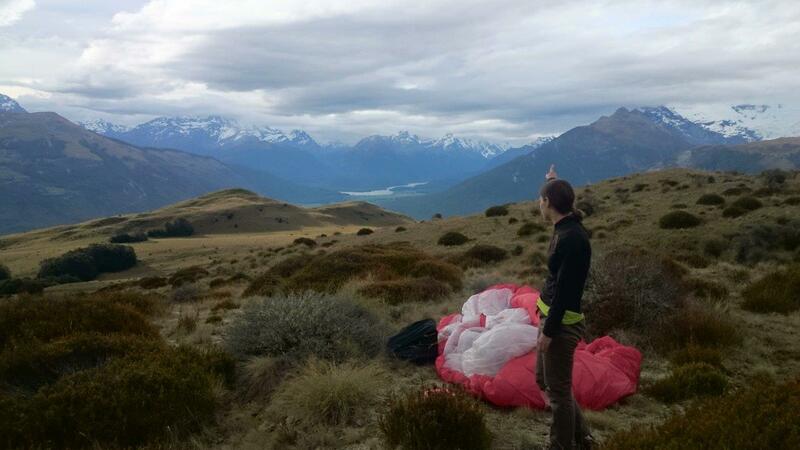 This entry was posted in Uncategorized and tagged adventure, flying, Gliding, mountains, New Zealand, paragliding, parapente, share my joys, vol biv, Wanaka. Bookmark the permalink. Wow, incredible flying with some mindblowing scenery, thanks for sharing. Wicked blog.. Love it.. Love it.. Love it!